Our new timetables, effective Sunday, September 30, feature seasonal adjustments and changes to accommodate ongoing infrastructure work and includes special service during the holidays. Extra "Fall Foliage" trains will operate between Grand Central Terminal, Beacon and Poughkeepsie on Oct. 20 and 27, and Nov. 3. —To accommodate the new train schedules, the 12:10 AM outbound from Grand Central Terminal to Southeast will have 1 minute added to its schedule between North White Plains and Valhalla to provide a consistent schedule duration; and the connecting 1:48 AM train at Southeast to Dover Plains will depart Southeast 1 minute later. —The outbound 1:20 AM train from GCT to North White Plains on weekends will arrive at North White Plains 2 minutes later. —The half-hourly trains which were truncated to Crestwood in support of the White Plains Station enhancement will be reinstated to North White Plains on several holiday weekend Fridays. The GCT-bound train leaving New Haven-State St. at 3:20 PM will depart 2 minutes earlier and adds a stop at Green's Farms. Please be sure to pick up a new timetable for possible changes to your commute. 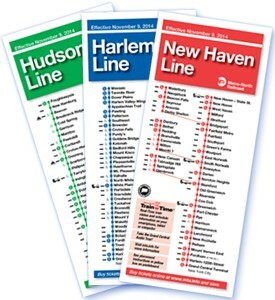 New timetables will be available in Grand Central, at outlying stations, online http://as0.mta.info/mnr/mstations/default.cfm and via our Metro-North TrainTime app http://web.mta.info/mnr/html/traintimeapp.htm for iPhone or Android. As always, we thank you for your patience as we continue to make critical improvements to our infrastructure.